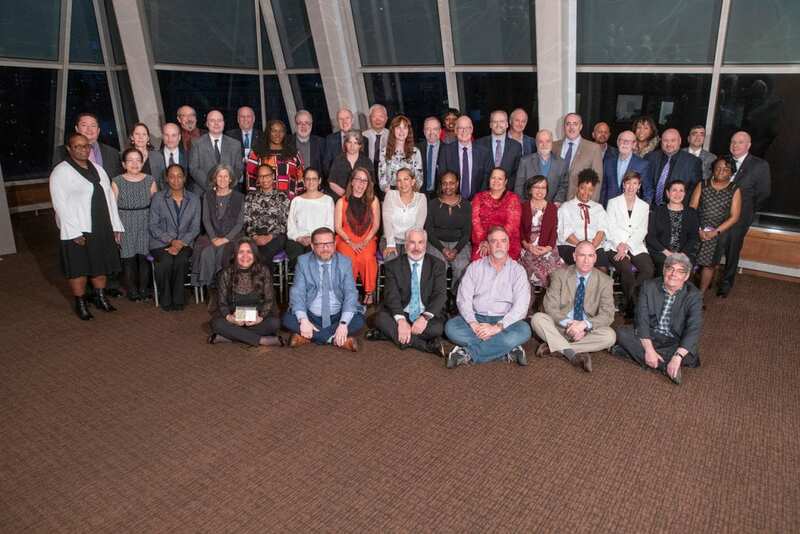 This Spring, thirty CALA faculty members have been honored with the NYUSPS Longevity Award. The award recognizes full-time and adjunct faculty for their dedicated service to SPS at a number of key milestones. So you need a translator. Go for a pro? Or settle for an amateur? Interested in learning more about furthering your education in translation? 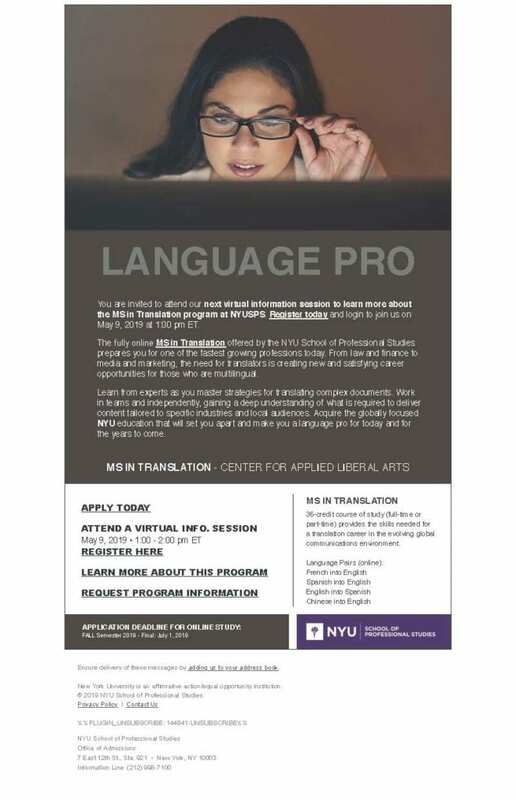 Attend the next virtual NYUSPS MS in Translation info session on May 9th. Click here to register. Congratulations to Ola Salem, a current MS in Professional Writing (MSPW) student, for writing one of Foreign Policy’s (FP) top ten stories of 2018! 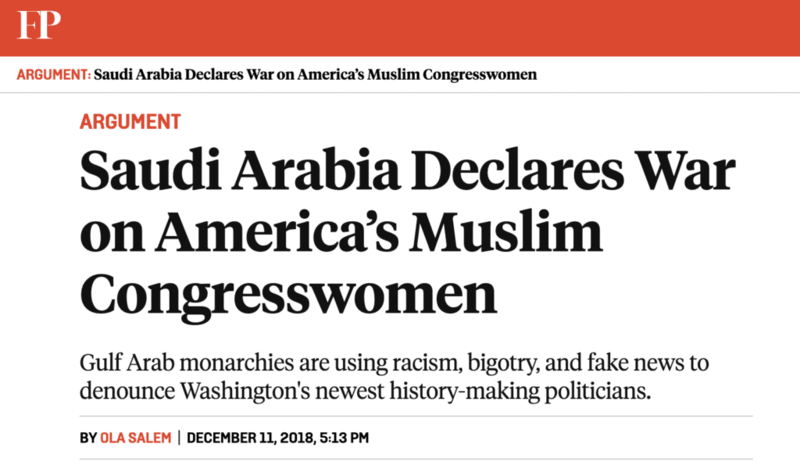 Published in December, Ola’s article Saudi Arabia Declares War on America’s Muslim Congresswomen was ranked as one of the most read FP articles for the year, based on reader clicks. Q: How did it feel to make Foreign Policy’s Top Stories of 2018 list? What was your first reaction? I was pleasantly surprised that my story was one of the most read in 2018 on the Foreign Policy magazine website. I was not expecting the piece to be so widely circulated. Within 24 hours of its publication a number of foreign and local media had picked it up and reposted it or wrote their own versions of the piece while referencing mine in their work. A number of US Congress members also shared the story on their social media accounts. Commentators on TV were discussing it with political analysts. One of the things we focus on while studying at MSPW is that our words are meant to be read. There is no greater form of flattery/pride for writers than to know our words have spread and are having an impact. Q: This semester, you are completing your internship course in the MSPW. Can you describe this experience? For the past three months I have interned at a multimedia organization in the heart of the US capital, Washington, DC. The hours have been long, but the experience has been vast. As I approach the end of my short internship, I’m thrilled to have had the opportunity to use some of the theory work from class in a real life setting. Q: How do you see this internship work helping to shape your future professional writing trajectory? This internship has helped me discover what I want from a job and what I would like to do once I graduate. As much as I enjoy news writing, I would like to do more investigative pieces and work on stories that I care about rather than cover every day events. I know that I would not have reached this conclusion if I didn’t work on breaking news with deadline pressure as I did in this internship and in my work prior to enrolling in the MSPW. Q: What other articles have you published since the FP top story? Since the December FP piece, I have co-written two more stories for the magazine. In the first article, The Secret Lives of Arab Princesses, I conducted more than a handful of interviews and drew on my own experiences living in the Gulf. In the second article, Arab Regimes Are the World’s Most Powerful Islamophobes, we look at Middle East governments and how they have forged alliances with right-wing groups in the West dedicated to anti-Muslim bigotry. All faculty in the MSPW have been supportive. 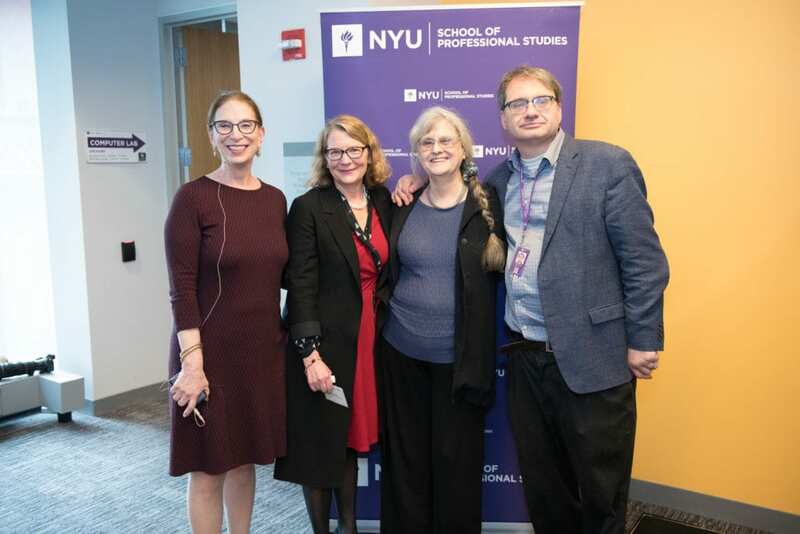 But two in particular have gone beyond their academic duties to support my work in class and outside of class, directing me whenever I was at a crossroads: Dr. Kristine Kerr has been my academic advisor since I began studying at MSPW in 2017. She has helped guide me in my classes and encouraged me to assert myself at my internship and continue writing; and Sonja Ryst shared her incredible wealth of knowledge and experience to our classes last year. Sonja was also supportive of my work outside of class and gave me the courage to write and pitch my stories. Below is a special invitation from ArtTable, a national non-profit organization that supports women in the visual arts. This event is free for NYU students and faculty, $15 for the public. For more information and to register, click on this link. The event is organized by ArtTable and NYU Steinhardt’s Visual Arts Administration MA Program, and will be moderated by CALA instructor Catherine Behrend. 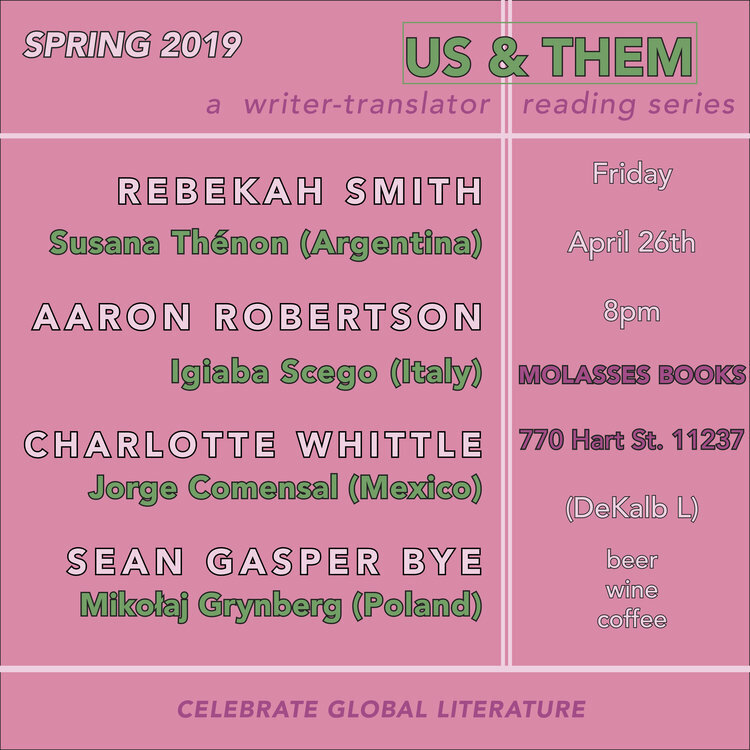 The next Us&Them reading will be taking place at Molasses Books in Bushwick on Friday April 26th at 8pm. The quarterly event series gives literary translators with parallel careers as writers a place to showcase both sides of their work. 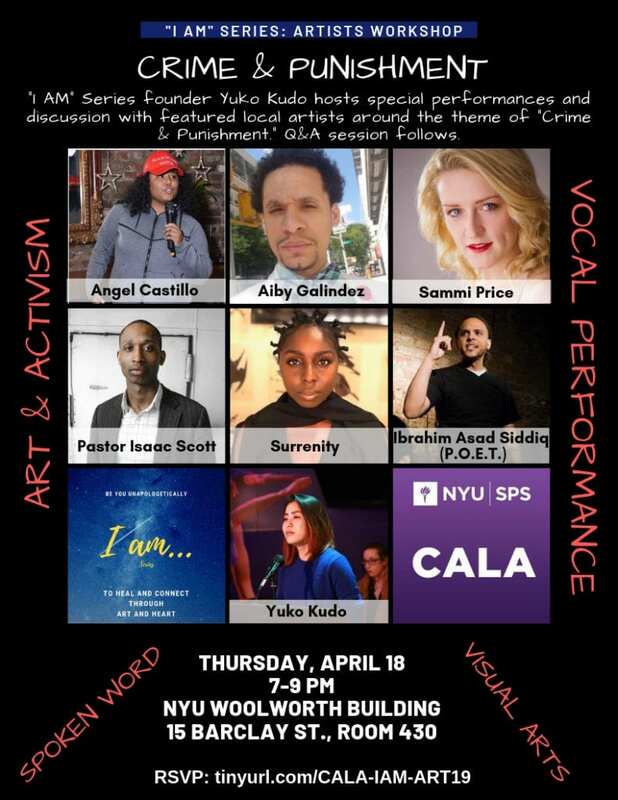 On Thursday, April 18, from 7-9pm, “I Am” Series founder Yuko Kudo, in collaboration with NYU SPS CALA, will host special performances from featured local artists around the theme of “Crime and Punishment.” Performers will include individuals who have been incarcerated or directly impacted by incarceration; some who work in or with prisons or re-entry programs; and others whose art is inspired by these frontline warriors. Guests will include members of the team that collaborated on The Work, a documentary that follows level-four convicts at Folsom Prison over a four-day group therapy retreat. Learn more about the evening’s guest performers in the bios below. Yuko Kudo, is founder and creator of the “I Am” Series which aims “to heal and connect with art and heart” through performing arts events and workshop/conversation series for mission-driven creatives. A member of SAG-AFTRA and EMC, Yuko has performed at The Kennedy Center and NYU Skirball, has appeared in various film and theater productions, and has had her photographs appear in Forbes Magazine. Angel Castillo – poet, writer, and author of This Is For You — develops pieces of writing that speak to her and others about homophobia, police brutality, absent parents, alcoholism, love, and other modern day issues, through the power of vulnerability, acceptance, possibility, trust, and God. Sammi Price is a Slam Poet and Actress, specializing in projects geared towards advancing the fight for equal human rights and liberal political activism. Sammi also works as a producer/script supervisor in film. Follow Sammi @sammi__price on instagram for more poetry, acting, and film updates. Pastor Isaac Scott is both artist and activist. As the founder and lead-artist for The Confined Arts at the Center for Justice at Columbia University, he spearheads the promotion of justice reform through the transformative power of the arts. Pastor Scott’s passion for equal human rights runs deep, and comes as a result of being directly affected by the criminal justice system and its disenfranchising nature. Since returning to society in 2013, Pastor Scott has combined fine art and graphic design to change the existing negative narratives of people in prison and of those formerly incarcerated. Ibrahim Asad Siddiq (aka P.O.E.T) is not your average spoken word artist, more so an activist and philosopher rooted in poetry. P.O.E.T is an acronym for Putting Out Eternal Thoughts. In addition to performing, he is the artistic director of a grassroots arts program known as The FREE ART Project, through which he facilitates workshops and hosts open mics and showcases throughout NYC and Westchester County. He conducts workshops for incarcerated youth, working with various ATI (Alternative to Incarceration) programs in the Bronx and Westchester. His overall goal is to create a community hub designed to cultivate creative expression and to develop the minds of future leaders, artists, inventors, entrepreneurs and innovators. Surrenity is an artistpreneur, performer and writer devoted to sparking mindfulness through performing arts in collaboration with societies most common and uncommon influencers at random, rehabilitative and renowned places around the globe. Find Surrenity with Stevie Wonder, Esperanza Spalding, Coldplay, Ariana Grande, Sam Smith and other notable influencers on The Voice, The Grammys, Saturday Night Live, your favorite national morning and late TV shows, in schools, prisons and marginalized communities. 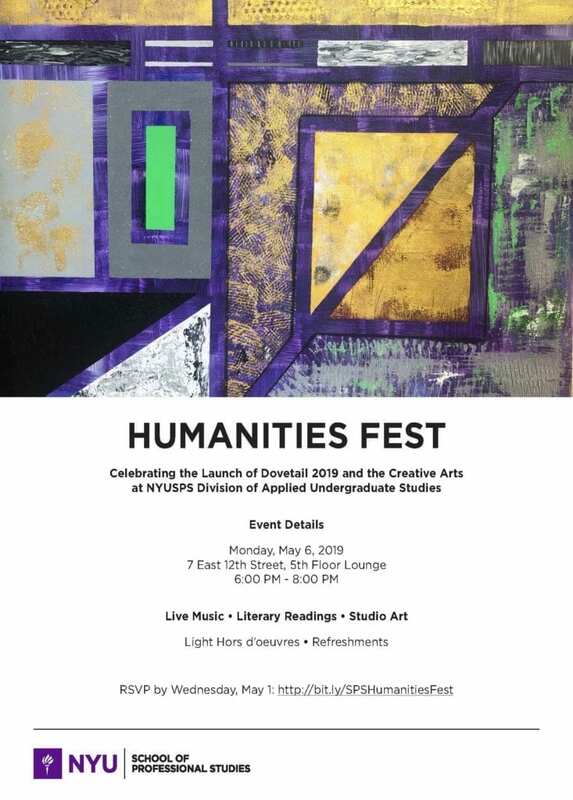 Please join the SPS Division of Applied Undergraduate Studies (DAUS) for the Humanities Fest at 6PM on Monday, May 6th, 2019. The event will celebrate the launch of Dovetail 2019 and the creative arts at SPS with live music, literary readings and studio art! Live music will be performed by Ozan Aksoy (Saz), John King (Oud), Harris Eisenstadt (Bata Drums), and special guest María Grand (Tenor Saxophone). A recent op-ed published by The New York Times investigates the potential impact of the decline in academic language programs in an increasingly multilingual world, as well as the grassroots efforts to reimagine language education that have emerged in response. Over the past five years—during which time colleges across the country have cut more than 600 foreign language programs—parents and educators have begun to push for holistic, real-world language curricula in their institutions at all grade levels, emphasizing the important role that languages play in the international flow of business and culture. Want to learn a foreign language or leverage existing language skills into a career in translation? Apply for our M.S. in Translation program, which is available in four language pairs: French to English, Spanish to English, English to Spanish, and Chinese to English. Registration is also open for our five-course, online Certificate in Translation Industry Essentials! This comprehensive certificate—available for all language pairs—will provide an overview of translation concepts and techniques, as well as hands-on training in the translation of documents from a wide range of fields: financial, commercial, legal, and other topics pertinent to today’s market. 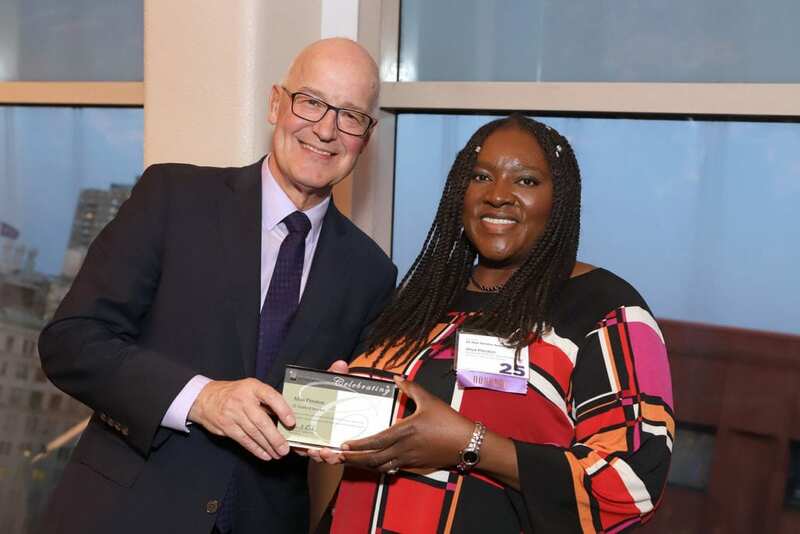 We are proud to announce that CALA’s Associate Director of Administration, Afua Preston, was recently honored with an NYU Service Award recognizing her 25 years of dedication to the University. Afua began her NYU career in Bobst, where she worked as a Stacks Department supervisor prior to joining SPS. For the past four years, Afua has been an invaluable part of the CALA team, managing a wide variety of administrative responsibilities to provide an exceptional experience for the staff, faculty, and students. Please join us in congratulating Afua on this milestone and in celebrating all of her hard work, generosity of spirit, and sense of fun. 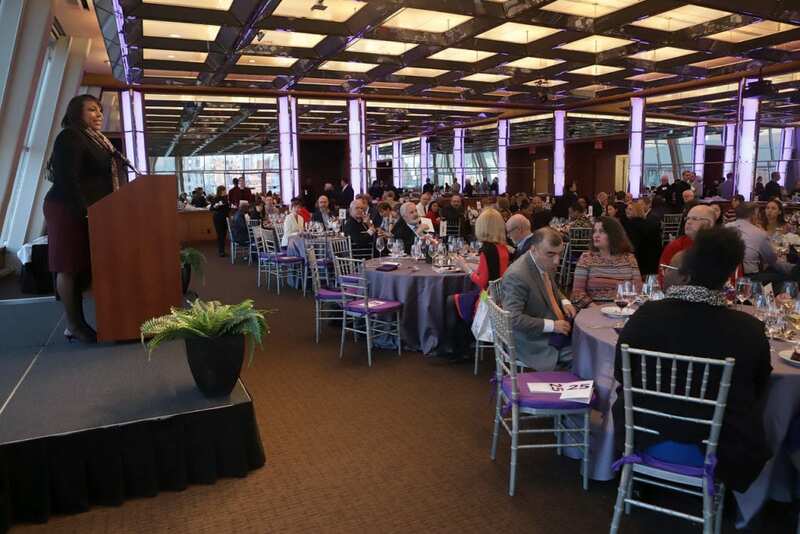 Check out some photos from this week’s awards dinner and reception with NYU President Andy Hamilton below. Tune in to CUNY TV for a screening of the film, Closely Watched Trains, followed by a discussion lead by CALA faculty, Leonard Quart. Leonard is an Adjunct Assistant Professor at NYU SPS CALA. He is a Professor Emeritus of Cinema at CUNY and COSI. He is a contributing editor to Cineaste; a columnist for Berkshire Eagle; and co-author of American Film and Society Since 1945, 4th edition (Praeger), and The Films of Mike Leigh (Cambridge University Press). He has also written innumerable reviews and essays on films and other subjects for Dissent, The London Magazine, Logos, and Film Quarterly. At a village railway station in occupied Czechoslovakia, a bumbling dispatcher’s apprentice longs to liberate himself from his virginity. Oblivious to the war and the resistance that surrounds him, this young man embarks on a journey of sexual awakening and self-discovery, encountering a universe of frustration, eroticism, and adventure within his sleepy backwater depot. 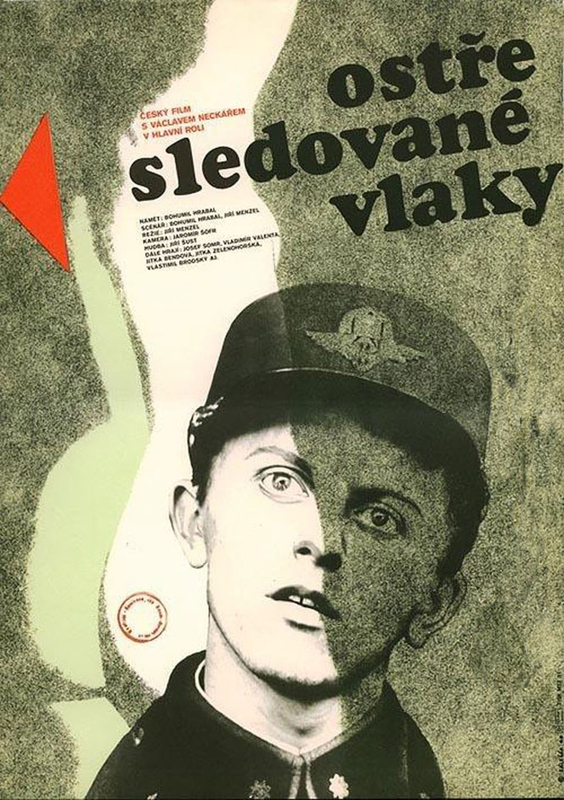 Wry and tender, Academy Award-winning, Closely Watched Trains, is a masterpiece of human observation and one of the best-loved films of the Czech New Wave. 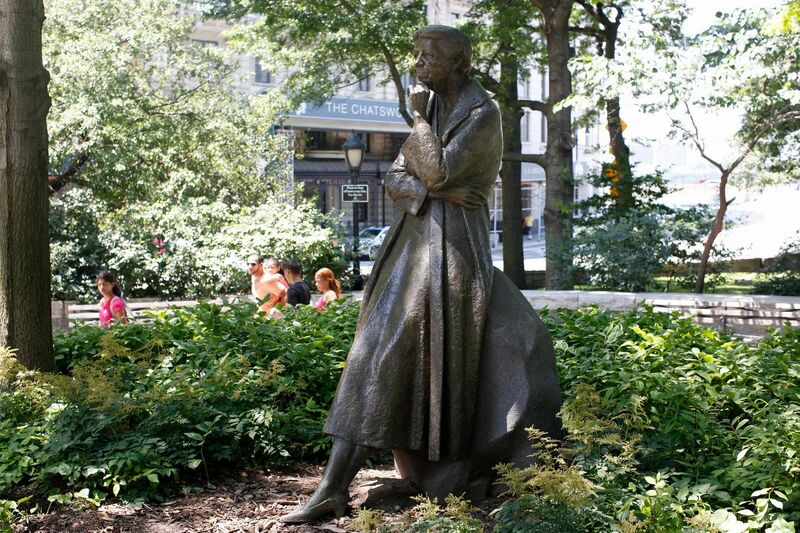 Click here for information on how to watch CUNY TV’s free programming. For even more great film screenings and discussions, take a look at all of the film courses available for the Summer semester.